Are your kids headed back to school? Have the nervous jitters kicked in? Or, are your kids confident as they start the new school year? At Experimac, we know kids love technology and if we can get kids to learn while having fun using the technology they like, then why not? 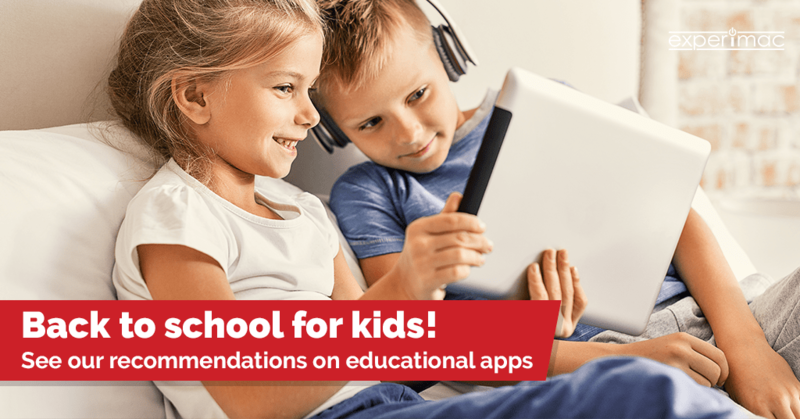 We have broken down our recommendations on the best educational apps for kids below because we want to help you and them have a successful school year. Whether your child needs a little help getting organized or is dreaming of exploring outer space and the planets, we’ve got you covered. These 10 apps are a fun way to reinforce what they learn at school during the day and help them keep track of deadlines, tasks, etc. This is one of the most helpful apps for students of all ages. Whether your child is struggling with Math, Reading, Social Studies or Science, this app has several interactive lessons and videos designed to create interest and understanding in a variety of topics without being too long to keep the average student’s attention. Many children struggle with completing Math assignments on their own. However, before looking for a tutor, take advantage of your iPad® tablet by downloading Photomath Camera Calculator and point your iPad tablet’s camera to a math problem printed in a book or on a worksheet. Photomath will not only provide you an answer, it will also show you a detailed explanation as to how to find the correct answer. Explore planets, space missions, astronauts, history, maps and videos with the NASA App. Imagine being able to explore outer space from the palm of your hand! This app’s purpose is to simplify your life by replacing paper planners and providing you and your children with the ability to schedule events, set up notifications, synchronize all of your smart devices and keep track of tasks that need to be completed. This could very well save your sanity. Need help citing sources for research papers and projects? EasyBib can help you with that. Whether you need to cite APA (American Psychological Association) or MLA (Modern Language Association) research papers, EasyBib can help you quickly using your iPad® tablet or iPhone® device. Simply take a picture of the book’s barcode or type the title of the book, and EasyBib takes over. You may be very familiar with TED Talks. Did you know that there are lessons designed by the same creators of TED Talks that discuss a multitude of topics in Social Studies, Science and more? These educational videos follow up with short quizzes about the video lessons. If your student isn’t reading yet, take a look at Hooked on Phonics. This app provides games, lessons and stories to teach children phonics and motivate them to read without frustrating your emerging reader. Don’t have the time to create flashcards? No problem. Quizlet is an app available on the iPad tablet that offers thousands of flashcards for countless topics to help students study for any exam. It also includes interactive games, study modes and practice tests, making studying easy and effective. One of the most helpful features of Quizlet is the ability to make your own flashcards for any subject area using your class notes, textbook or online resources. Note taking is now much easier thanks to apps like Evernote. Evernote allows you to take notes in a variety of ways, all on your iPad tablet. Whether it is taking a picture, creating a list or writing down a reminder, this app makes these notes easy to create and easy to share with other devices. Projects, assignments and day-to-day activities are all made much easier for your child with this app. Your child can then share their notes with you in a group notebook so you can keep tabs of what they’re learning in class. Do you know all 50 states? Chances are your student doesn’t. Geography is something people of all ages seem to struggle with. Help change that by using this app. Stack the States has games and questions that help you learn to identify the United States. Remember Experimac is your go-to resource for all of your family’s Back to School tech needs. We stock a large variety of certified pre-owned phones, tablets, laptops, computers and more to help your student stay on the path to success this year. If it’s time to trade in and upgrade their current devices, we can help you with that too. See you at your local Experimac! Next Next post: What does your Ringtone Say About You?